Also known as the Silver Tip, Silver Needle white tea (Baihao Yinzhen) was only invented in 1857, but now ranks as one of China's 10 Famous Teas. Baihao Yinzhen means White Hair Silver Needle. Why? Because it is covered with lots of white hairs, which give it a silvery appearance. It is also straight as a needle. If you are looking for the highest quality white, you have found it. As a bud tea, it has no leaves, just the youngest and fattest buds picked earliest in the season. 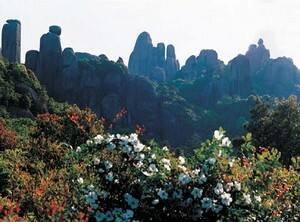 It ranks among other celebrities such as Longjing tea and Wuyi Rock tea as one of China's 10 Famous Teas. Modern white tea history began with the re-invention of Silver Needle at the Fuding County of Fujian Province in China. The original white tea was made from the Vegetable Tea (Caicha). It is a seedling variety. The breakthrough came in 1857, when the Big White variety, native to the nearby Taimu Mountain, was successfully cultivated in Fuding County using the propagation method. Its enormous buds and showy white hairs make it ideal for making Silver Needle. Production started in 1885. It was an instant hit - the Big White sold for 10 times more than its predecessor. First exported in 1891, Silver Needle white tea was hugely popular overseas, until the first world war struck and reduced trade to a trickle. History has gone a full cycle - it is regaining its allure with foreign drinkers in recent years. The making of white tea consists of 3 stages: harvesting, withering and drying. It is in stark contrast to green tea and oolong tea. It does not undergo fixation, where high heat is applied to kill the enzymes and stop the oxidation. Pick one leaf with one slightly unfurled leaf, then extract the central bud for further processing. Ideal picking season is spring. First two rounds yield the fattest and sweetest buds from the top of the tea bushes. Third and fourth rounds yield "side" needles that are thin and small. They make low quality needles. Autumn tea is said to be good, while summer tea is low quality. Not all the tea gardens can last several rounds in one season. Some organic tea gardens are so low yield that they last only one round of picking. Spread out fresh leaves thinly on bamboo mats for up to 3 days in a bright and well ventilated room. Natural withering takes place indoors or under the sun. Artificial withering takes place indoors at higher temperature. The aim is to reduce moisture to 20% before drying. Oven-bake the buds at low heat to about 30 to 40 degree Celsius. After that, remove any debris and discoloration to maintain the uniformity. Finally, re-oven to reduce moisture to under 5%. Package into an airtight container. The Zhenghe Sliver Needle follows a slightly different process. Instead of oven-baking, where weather permits, leaves are dried naturally under the sun. There are two kinds of Chinese Silver Needle white tea: Fuding and Zhenghe. 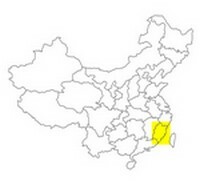 Fuding is known as the Northern Style (Beilu), whereas Zhenghe is known as Southern Style (Nanlu). Fuding Needle is silvery-white; Zhenghe is silvery-grey. Some vendors prefer Zhenghe to Fuding, as its sun drying process gives it a stronger, more toasted flavor. It really is a matter of personal taste. In practice, other factors such as tea garden quality, harvest timing and withering method have a bigger impact on quality. This wonderful AAA grade Silver Needle tea comes from an organic farm in Fuding and is handcrafted using the traditional withering method. Yuan Di Shun (2006). Zhongguo Baicha. Xiamen Daxue Chubanshe.